A leading manufacturer and distributor of bearings to the engineering industry has moved and expanded its operations to the Black Country, more than doubling the size of its industrial unit. 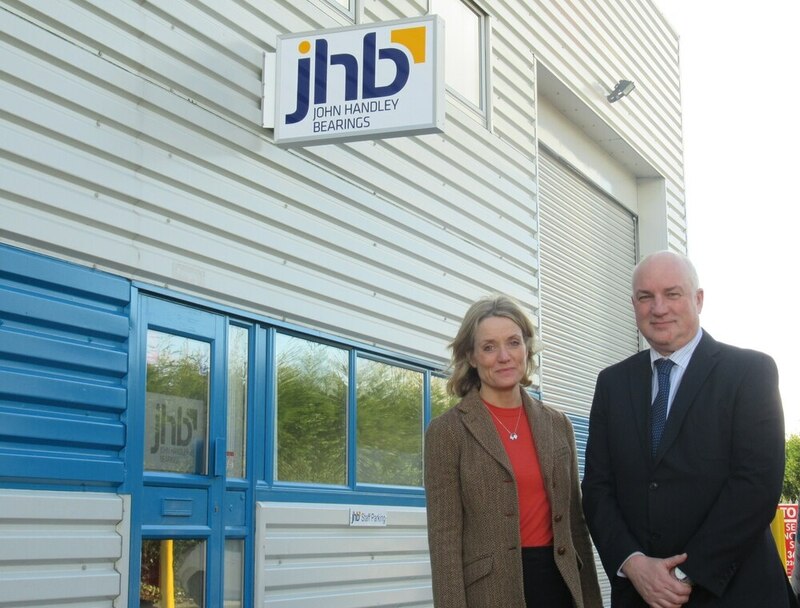 Lucie Tait-Harris, commercial director, and Paul Mitchell, managing director of John Handley Bearings, which has moved to The Pensnett Estate. John Handley Bearings has moved from Wombourne to Building 69, Bay 6, at The Pensnett Estate, from where the family-run business will supply high-quality linear bearings, split bearings, rod ends and plain bearings that are used in applications in sectors such as motorsport, mining, oil and gas and food production. The company, which supplies products on behalf of two major bearings manufacturers –Thomson Linear and NSK – took a 15-year lease for the 7,500 sq ft unit at the estate, which is owned and managed by national commercial property and investment group LCP. It follows a sustained period of growth 12 months after being acquired by the Bowman Group, which supplies original equipment manufacturers, stockists and distributors across a wide range of industries worldwide. Lucie Tait Harris, commercial director at John Handley Bearings, said because there had been significant investment in its stock since Bowman Group acquired the business, it needed a larger facility. It looked at a number of options before settling on The Pensnett Estate. “The Pensnett Estate ticked every box. Many of our customers are based in the Midlands based, with a number of customers being located on the estate itself, so it didn’t make any sense to move away from this part of the West Midlands,” she said. “It’s perfectly located for us and it means we can extend our radius in the West Midlands for free local delivery on all orders. The larger facility also enables us to house Bowman International stock in the Midlands, making it available for same day delivery. It is looking at employing additional staff in the coming months, but has not yet identified roles or numbers, she added. LCP is one of the UK's largest private owners and managers of retail, industrial and office property to let, managing a portfolio of more than 19 million square feet of commercial property across the UK. Its flagship industrial estate is The Pensnett Estate, Kingswinford, which at 185 acres is one of the largest secure industrial estates in Europe and home to almost 200 companies. Its retail portfolio comprises more than 6.4 million square feet and 310 sites and has a strong focus on the local and convenience shopping sector. LCP owns and manages a number of shopping centres including the Wulfrun Centre in Wolverhampton.